This book provides a fascinating study of Hindustani music in its sociological perspective. It is a wonderful study for depicting the social interaction that takes place in guru-shishya parampara handing down the tradition of music and strictly preserving a style through pedagogy. The book also explains the social status and organisation of the musician-community and a psycho-social analysis of the journey of a musician from an individual being to a social being. The author individual being to a social being. The author has carefully traced the history of Hindustani music in its socio-political perspective. She has amply proved what an interdisciplinary study can achieve for great art like Hindustani music. It is a treat to observe the author‘s scholastic insight into the realm of music and her grasp of the concepts of sociology. The relationship of society and music is intense and complex. The author has successfully grappled with such complexities and arrived at logical conclusions. She has justified the worth of sociology of music, both for the musician and the listener who may the better understand each other with knowledge provided through this deep study of music and society. Born in 1969 Dr. Nivendita Singh is an accomplished classical vocalist. She has combined her concert career with her academic pursuits in music. Having an excellent academic career Dr. Singh obtained her Masters degree in Music with first class first from Punjabi University, Patiala and, her research degrees of M. Phil. and Ph.D. from Delhi University. She has to her credit several research papers and articles dealing with different aspects of music Currently she is teaching music at Punjabi University, Patiala. Sociological approach to art is a recent phenomenon, but it has gained impetus due to the increasing network of performances, media centres and public interaction. The fact that the study in the field of music could not be taken seriously till now can be attributed to two reasons: (i) ignorance of the musicians about the concept of system of sociological research; and (ii) sociologists’ apathy towards the study of socio-cultural phenomena has gained momentum. The interaction and cross fertilisation of music with some social sciences such as sociology, ethnology, ethnology, cultural anthropology and psychology, have contributed to the better understanding of music in its social context. Sociology, ethnology, cultural anthropology and psychology, have contributed to the better understanding of music in its social context. Sociology of culture would thus focus upon the relationships between the components of culture, cultural themes, process of its integration and change and its level of adjustment. Arts form a major part of study of the internal dynamics of culture notion. Indian music is a sublime form of music and is a living art. It has the dynamic power of symbolizing human feeling and conceptions in sweet and soothing sounds. It has its roots in the most primitive savage life, evolving through various phases of civilisation and it will proceed on to the eternal future, in various changing forms and trends. Thus, it can be conceived as a component of socio-cultural system. The history of music is closely associated with human society and both have a great influence upon each other. 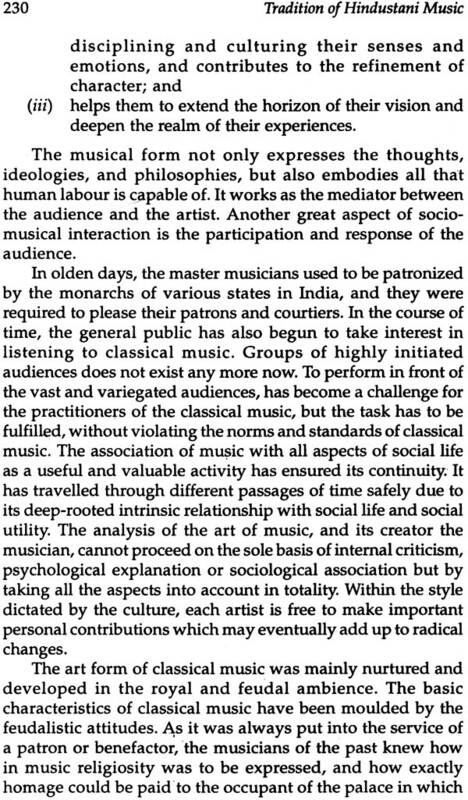 Therefore, the sociological factors which are behind the creation of music can neither be neglected, nor ignored, as it is a product of the intellect and creative faculty of human society .In the followings pages an humble attempt has been made to highlight these sociological factors behind the growth and development of music. Setting up in of the social and economic models and institutions leads to the birth and growth of culture and its adjunct art. Once developed, these social institutions themselves become the promoters as well as guardians of art and sciences, affording them scope, protection and encouragement for future development. The sociological associations and institutions like family religion, state, etc. have tremendous influence on and contribution towards the growth and development of music. Many times music has flourished under their patronage. 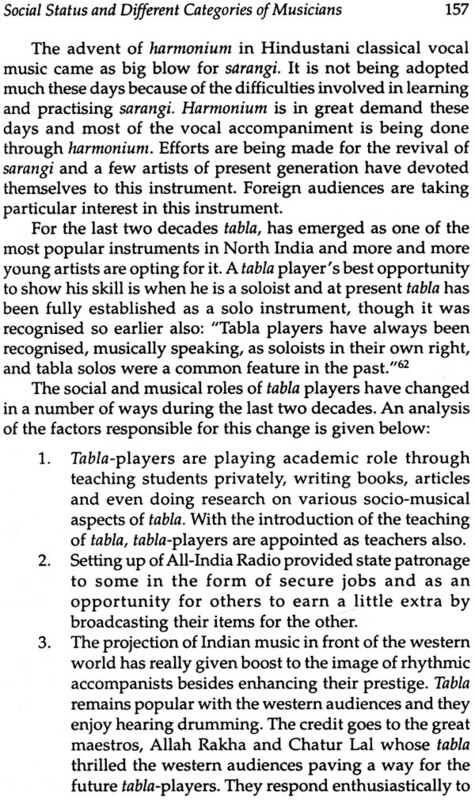 This book is also an attempt to give analytical description of their role towards the development of music. For communication among the members of a group, certain common terms and symbols are used. Musicians, as a social group have their own code of values and customs to be observed. The Hindustani system is fundamentally an oral tradition in which the actual performances are derived not from written and readymade scores, but from remembered repertories which have been learnt from the guru’s mouth. The basic set-up of Hindustani music which comprises oral tradition and improvisation, leaves a vast scope for its sociological study. Sociology has abundant material for study in the pervasive influence that music has had upon human societies, and in the manner in which musical traditions have created their own very special groups within the larger community. Conversely, different forms of music have always been affected by the socio-cultural contexts in which they arise. The social organisation of the community of musicians has an almost similar structure as that of society in general. The world of music has its own hierarchy, environment, ideology, beliefs and values, traditions and customs, relationships and methods of training. 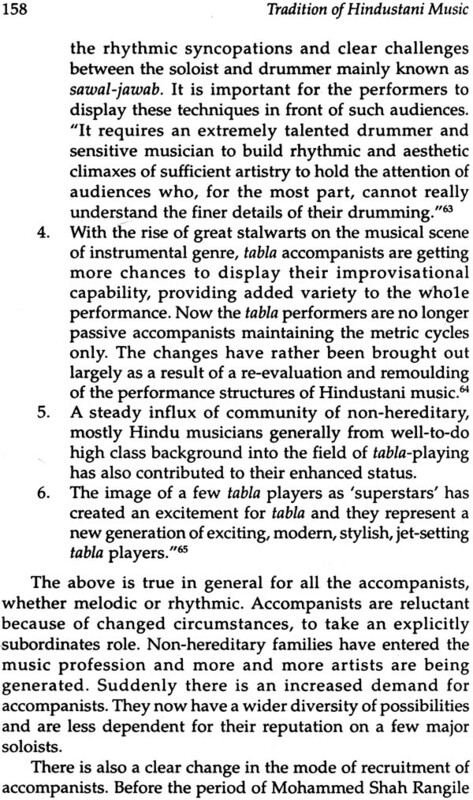 All these factors constitute an interesting sociological background for music and musicians. The present study shall be done from two different angles. One is the study of social organisation of musicians and development of music in the context of contemporary social, political and economic circumstances and the other is the study of the social structure of musician-community. 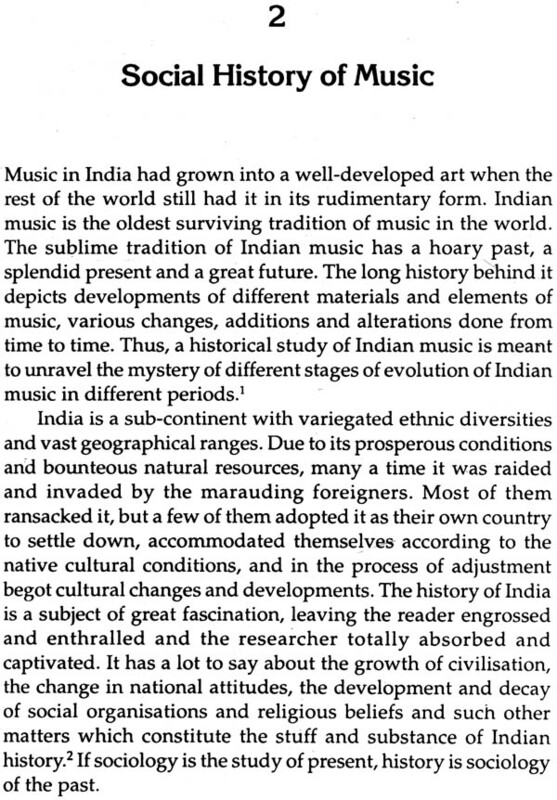 Indian music has survived as a glorious tradition through the persistent efforts of its practitioners and patrons. One also finds in have contributed through their folk tunes, lingual dialects, rhythm which have contributed through their folk tunes, lingual dialects, rhythm patterns and singing styles. This process of adaptation and assimilation is in continuation up to the present day provides a big scope for sociological study. Our music has survived under the patronage of a number of generous patrons. Religion and royalty provide a rich background for studying the sociology of music. The great tradition of Hindustani music a adjusting its articulations with the changing trends of Indian culture, and musicians have evolved adaptive strategies with the change in patronage modes to survive. In the proliferation of new occupational and performance roles, innovations in training and expanded rules of recruitment, diversification of listening public and patrons, changed relations and social identities of musicians, the social organisation of the traditions of Hindustani music is undergoing a change. The probe behind the factors and scope of this change comes within the purview of the sociology of music. The first chapter of this book is a description of interrelationship of music and sociology. Sociology is the study of society and human behavior, and culture is the sum total of the actions in a society. Culture finds its manifestation through different modes and music is an art from which is a signification aspect of culture. 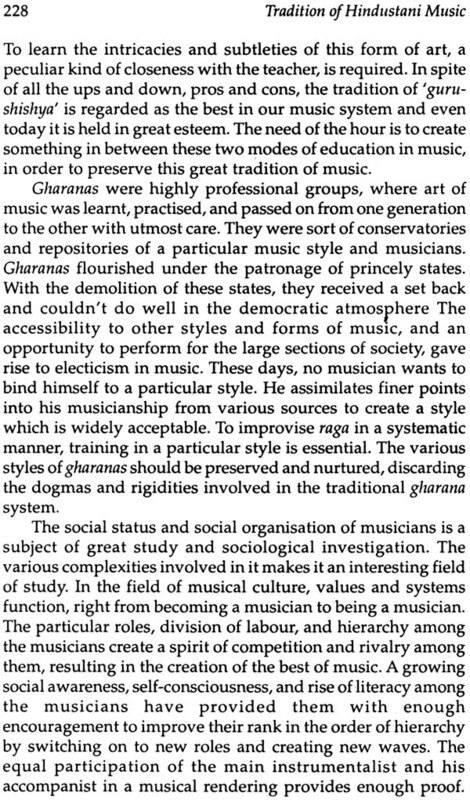 The entire chapter rests on the assumption that music, cultural and society are interrelated. 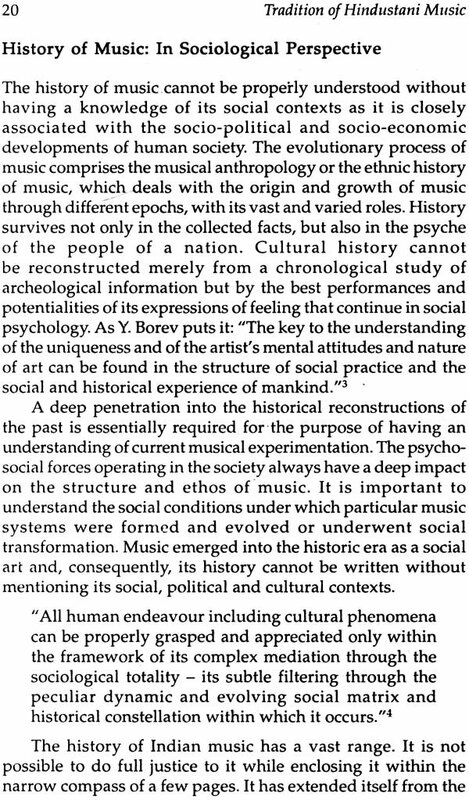 The chapter also provides a brief study of the sociology perspectives of music. 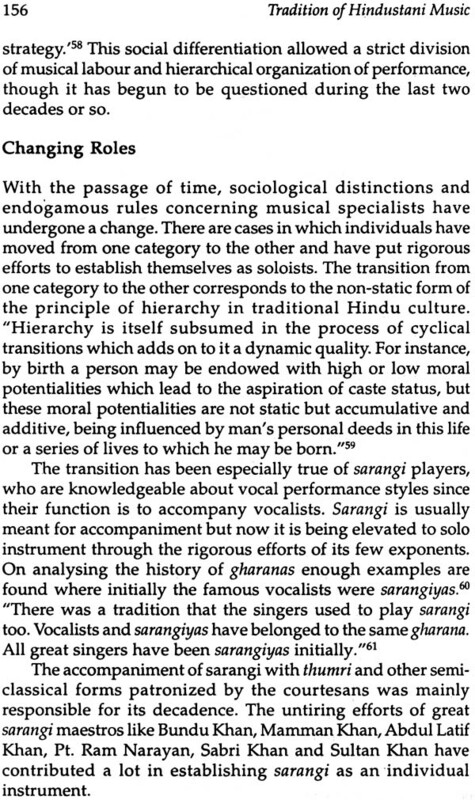 The second chapter provides a brief view of the history of Hindustani music, particularly in the socio-cultural context. In its course of development, Hindustani music has assimilated various cultural trends into it, and has ultimately emerged as a sublime tradition, blooming and flourishing. History gives us ample proof that changes in the socio-political system have directly influenced the content and form of music. 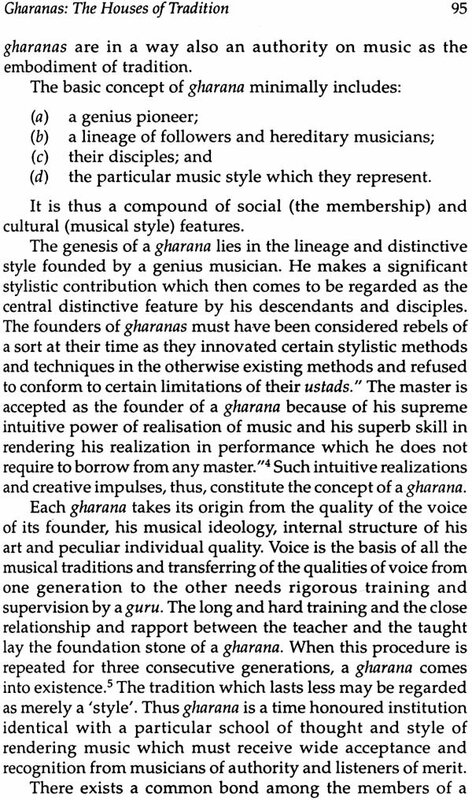 The melodic structure, rendering styles and modes of pedagogy have been visibly influenced by the changes in the patronage. In India music has flourished under the patronage extended by religion and the royal courts and it has always enjoyed their special attention. The third chapter sheds light on the traditions, customs, values and teaching methods, observed in the oral tradition of music. 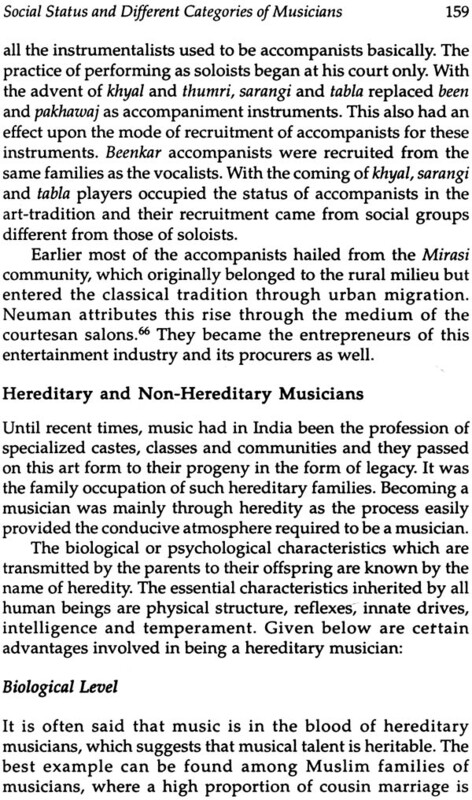 The glorious tradition of Indian music is handed down from generation to generation by the method of oral-teaching. The concept of revealed literature or knowledge (Shruti) is given an important place in the whole Indian education system. It is in the context of Indian music that oral tradition assumes greater importance. 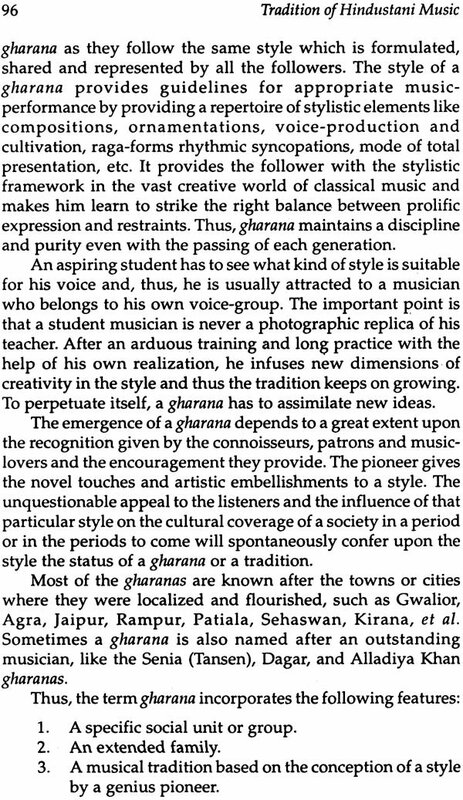 The emergence of guru as an institution in the socio-cultural organisation of Indian music is the basis of this chapter. Of great importance in the course of musical development is the social interaction that takes place in pupil- teacher relationships. The process of handing down the tradition of music to the following generations, strictly preserving a particular style through pedagogy is a unique concept of our music. Literally, gharana means the genealogical tree of the ancestry of one single family. 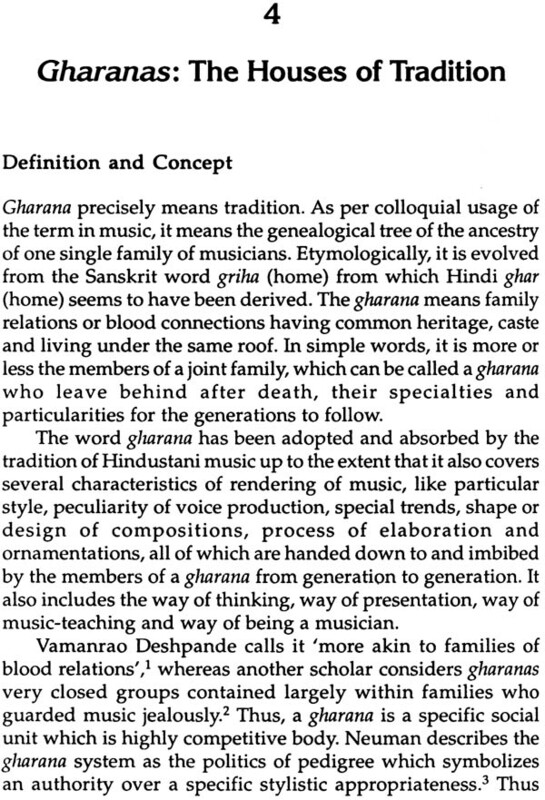 The word gharana has been adopted and absorbed by the tradition of Hindustani music up to the extent that it also covers several characteristics of rendering of music, such as particular style, peculiarity of voice production, special trends, shape or design of compositions, process of elaboration and ornamentation. 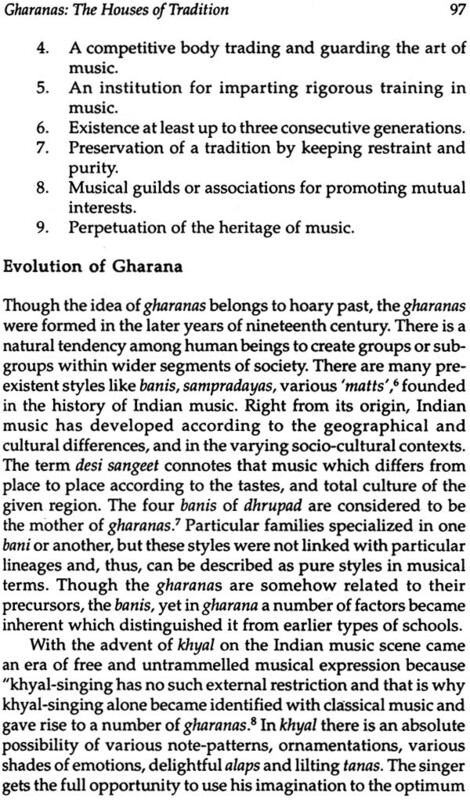 All of these are handed down to and imbibed by the members of the gharana from generation to generation. How these gharana preserve their styles, how they interact within themselves, provide an interesting material for sociological study which has been discussed in the fourth chapter. The next chapter deals with the social status and organisation of the musician-community. The status varied during different historical epochs. Political, economic, social and cultural changes have influenced music and the musicians from time to time. The social status of a musician largely depends upon the social conditions, social relativity and utility of his art and his relationship with the state. The community of musicians has its own social oranisation and hierarchical structure. Division of labour among them assigns them the particular roles they have to play. The chapter also deals with the professional musician- communities and their contribution to the preservation and perpetuation of music. The sixth chapter provides a psycho-social analysis of journey of art from an individual to the society. Art activity comprises of the creator, the creation and the consumer. The tirade largely constitutes the whole theory of sociology of music. Musician is a product of his social environment and he creates in order to convey his ideas and feelings to the recipients. 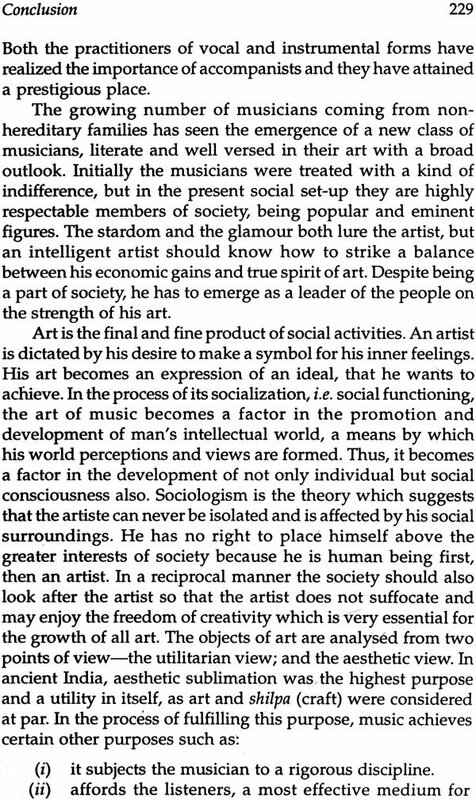 Thus, the musician as an artist has a responsibility towards society. He gives expression to his individual thought which always inspires the collective thought. At the same time he becomes an instrument through which society expresses itself. 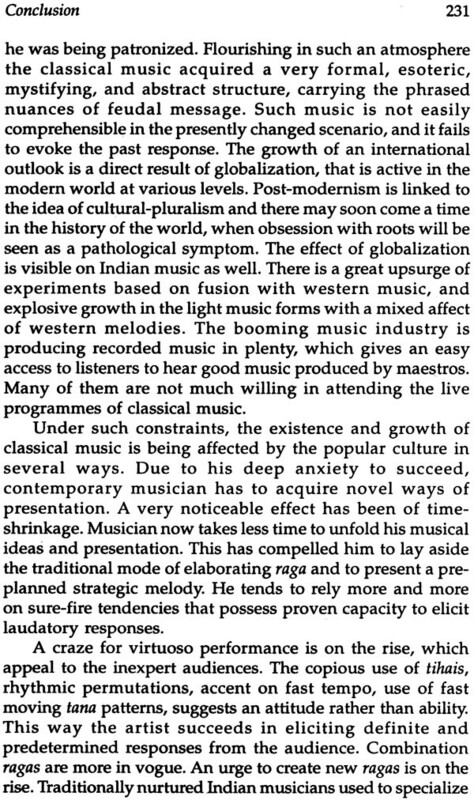 In the concluding chapter, it has been analysed that the expression and impression of Indian music are impregnated with tremendous sociological possibilities. In Indian a serious study in this direction has been taken up only quite recently. 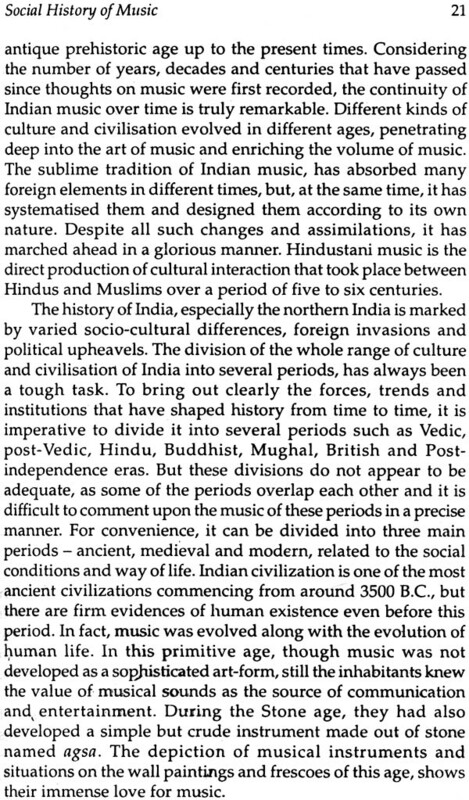 The traditional outlook of India scholars of music and musicians was a hinderance in the way of accepting the theory of sociology of music by them. Since the times the artist has been on his own to face the world without any regular patronage, he is compelled to think more without any regular patronage, he is compelled to think more in sociological terms. In the present times, the musicologists and musicians are not only obsessed by the concepts of arts and aesthetics but are fully aware of the political situation, social texture, economic structure and cultural institutions of the social texture, economic truture and cuktural instiutions of the social system. The advent of music-industry and commercialism is music have further increased the scope. In the present book, we have made a sincere effort to present the comprehensive sociology of music. We have done so, in short by touching almost all the areas, though it was quite difficult a task to sum up the topics in these limited number of pages. 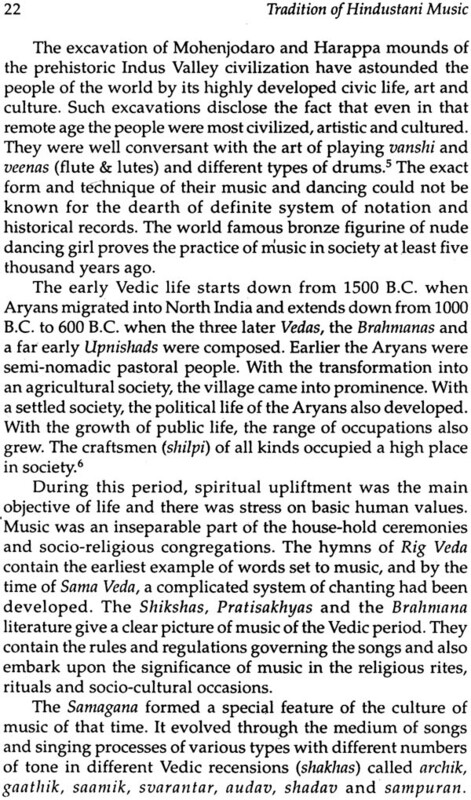 Indian concept of culture and philosophy has been taken as the basis for the study. Impact of socio-political situations on music, effect of music on the society, social status and cultural organization of the musicians, perpetuation of the tradition of music, four key concepts of sociology of music have been dealt with extensively.